Song of a Northern Dusk-singing Cicada (scroll down for explanation and additional recordings!). 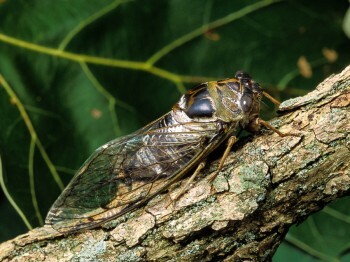 The largest of the eastern and central cicadas, the Northern Dusk-singing Cicada is black bodied with dull green and brown accents and with portions of its body covered with cottony white material. Found in nonmountainous eastern deciduous woodlands, where it sings from high in trees (individuals are occasionally found singing from low branches). Named for its habit of singing almost exclusively at dusk. 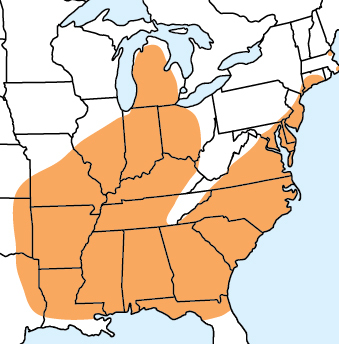 This species is attracted to the glow of high-intensity sodium vapor lights; exhausted cicadas can often be found on the ground under the lights. Captives often emit a very loud alarm buzz, reminiscent of a fire alarm bell. Song: A heavy pulsating drone lasting about 15–20 seconds, with a peak frequency of about 3 kHz: drrr-drrr-drrr- drrr-drrr-drrr . . . Often smooths out near the end, before tapering off and ending abruptly. 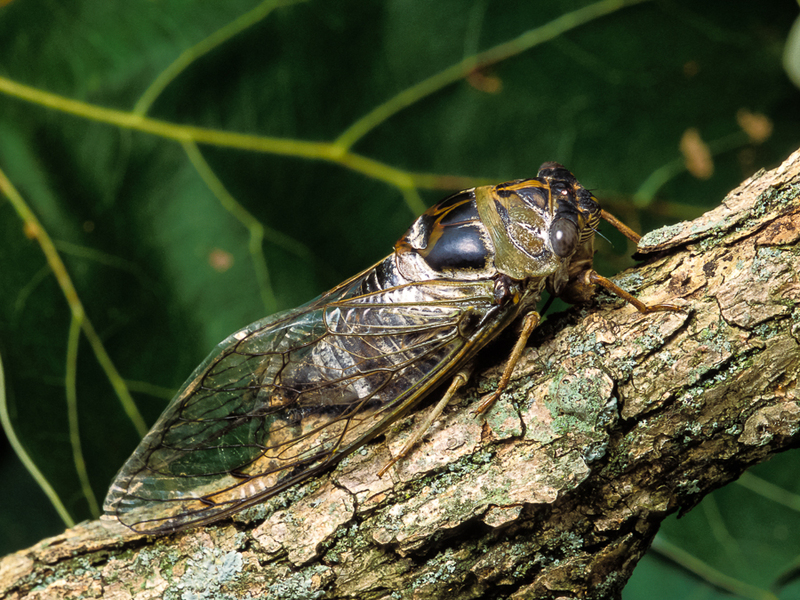 Easily recognized by its low pitch in comparison to the songs of most other cicadas. Sonogram of a Northern Dusk-singings Cicada. © Wil Hershberger.